With Pattern on Demand you can offer your customer the opportunity to co-create their personal clothing style in terms of cut, shape, colour and fabric. You can confidently face the great challenge of converting the order reliably, quickly and simply into the corresponding pattern and preserve it for future orders. For controlling a continuous and consistent workflow from webshop to pattern cutting, Gertsch Consulting & Mode Vision have developed the programme Pattern on Demand. This programme helps you to process made-to-measure orders efficiently and with maximum confidence. In particular for custom-made production and made-tomeasure manufacture, GRAFIS CAD demonstrates its great strengths. The control of styles via body measurements and parameters and triggering of automated processes from outside is carried out by Pattern on Demand via the optional script interface. 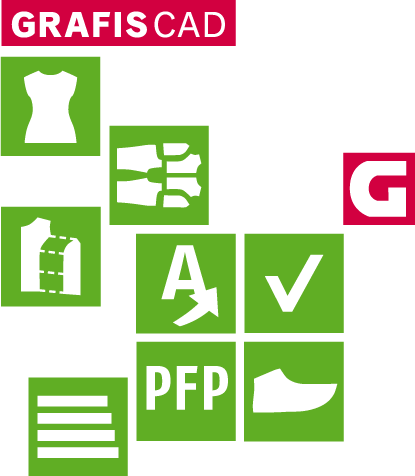 An order placed in the web-shop drives GRAFIS CAD to automatically create and output a style pattern based on the selected options and entered measurements. Immediately after an order has been placed you can now output the layplan for manufacture.